[181 Pages Report] The cognitive security market is projected to register a significant growth rate over the next 5 years, due to the increasing number of security breaches and cyber-attacks, and the rising adoption of the Internet of Things (IoT) and Bring Your Own Device (BYOD) trends across verticals. 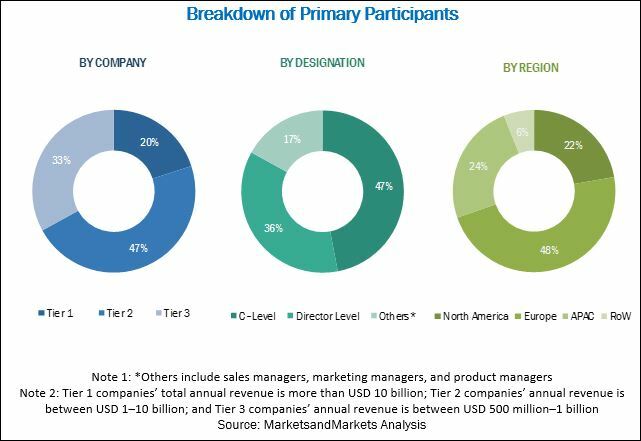 The global market size was valued at USD 2.77 Billion in 2017 and is projected to reach USD 17.09 Billion by 2023, at a Compound Annual Growth Rate (CAGR) of 36.4% during the forecast period. The base year considered for this study is 2017, and the forecast period considered is from 2018 to 2023. The objective of the study is to define, describe, and forecast the cognitive security market on the basis of components (solutions and services), deployment modes (cloud and on-premises), applications (threat intelligence, anomaly detection and risk mitigation, automated compliance management, and others), enteprise size (large enteprises and SMEs), security types (physical security and cybersecurity), verticals (aerospace and defense; goverments; Banking, Financial Services, and Insurance (BFSI); IT and telecom; retail; manufacturing; energy and utilities; and others), and regions. Moreover, the report aims to provide detailed information about the major factors, such as drivers, restraints, opportunities, and challenges, influencing the growth of the market. Further breakdown of the APAC cognitive security market. The cognitive security market is expected to grow from USD 3.62 Billion in 2018 to USD 17.09 Billion by 2023, at a Compound Annual Growth Rate (CAGR) of 36.4% during the forecast period. The major driving factors for the cognitive security market growth are the increasing number of security breaches and cyber-attacks, and the rising adoption of the Internet of Things (IoT) and Bring Your Own Device (BYOD) trends across verticals. The solutions segment is expected to account for the larger market size during the forecast period. The real-time security analytics and visualization platform plays a crucial role in detecting anomalies and preventing unusual behaviors or cyber-attacks. On the contrary, the services segment is expected to grow at a faster rate during the forecast period, owing to the growing need for the proper implementation of cognitive security solutions. The cloud deployment mode is expected to account for the larger market size and is expected to grow at a higher CAGR during the forecast period, as the cloud deployment mode is more preferred for mobile and web application security. The large enterprises segment is expected to account for the larger market size during the forecast period, whereas the Small and Medium-sized Enterprises (SMEs) segment is expected to register a higher CAGR during the forecast period, as attackers mainly target SMEs to penetrate their applications for accessing customer information, payment details, and other confidential data. Among the security types, the cybersecurity segment is expected to have the larger market size and is projected to grow at a faster rate during the forecast period. The rapidly growing connected devices have made enterprise networks more prone to cyber threats. Therefore, the demand for cognitive solutions is expected to be more during the forecast period. Among the applications, the threat intelligence application is expected to be the fastest growing application in the cognitive security market, whereas the anomaly detection and risk mitigation application is expected to have the largest market size during the forecast period. Anomaly detection and risk mitigation is a network security application that monitors networks to identify abnormal activities and report them. Among the verticals, the Banking, Financial Services, and Insurance (BFSI) vertical is expected to be the highest contributor in terms of the market size and is projected to grow at the fastest rate during the forecast period, as this vertical holds large volumes of sensitive information related to employees, assets, offices, branches, operations, and customers. Therefore, the demand to protect sensitive information is always high in the BFSI vertical. The healthcare, energy and utilities, manufacturing, retail, government, aerospace and defense, and IT and telecom verticals are also expected to contribute significantly to the growth of the cognitive security market to safeguard information and quickly identify and prevent cyber-attacks. 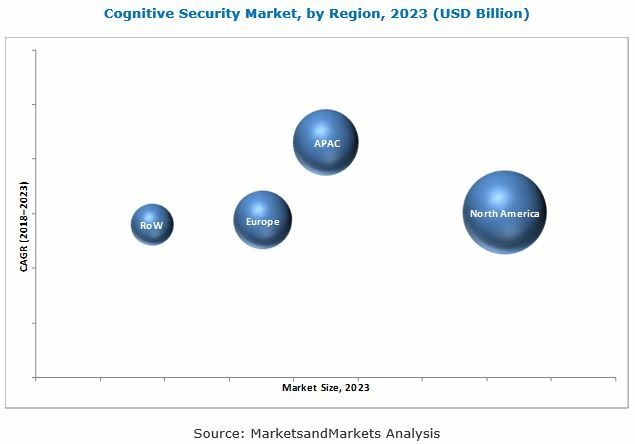 The global cognitive security market has been segmented on the basis of regions into North America, Europe, Asia Pacific (APAC), and the Rest of the World (RoW). North America is expected to be the largest revenue generating region, due to the growing demand for cognitive security solutions to safeguard business data. These regions have the most competitive and rapidly changing market across the globe. APAC is expected to be the fastest growing region in the market during the forecast period. Moreover, the APAC region is expected to be a highly potential market, due to the growing digitalization rate and the surging government policies. These factors are expected to contribute to the growth of the market across the region. Furthermore, concerns such as the rapidly increasing insider cyber threats and the lack of skilled security professionals may affect the growth of the cognitive security market. These factors increase the risk of failure for organizations, thereby necessitating the need for effective cognitive security solutions.